3/14/18, Ft Worth, TX – The Human Milk Banking Association of North America (HMBANA) and its 27 nonprofit human milk bank members reached new heights in 2017, with donor human milk distribution capping 5.75 million ounces dispensed to fragile babies throughout Canada and the US. The size and geographic reach of HMBANA’s network of collaborative, nonprofit milk banks ensures robust supply and service. All HMBANA members share the same high clinical standards while advocating ethical sourcing and equitable distribution of donor milk, and providing community breastfeeding support. The graphic below charts the network’s growth by distribution of ounces of pasteurized donor human milk. 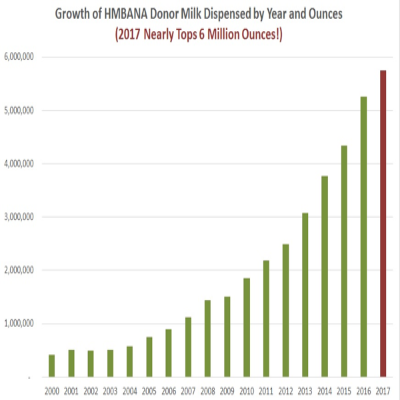 In 2000, HMBANA milk banks distributed under half a million ounces; by 2017, their supply grew five times over and they distributed 5.75 million ounces.